This is one of those projects I’ve wanted to tackle for a long time. All the backyards along our side of Redlands Place perch atop the rim of a spacious and wild chaparral canyon, with half the property in back of the houses comprising a rather steep hill that merges into the hillside below. Most of our neighbors have installed pools or decks to extend their back yard space; from the beginning I planned to terrace our bit of hillside into garden beds, to take advantage of the south-east exposure. But there were challenges. 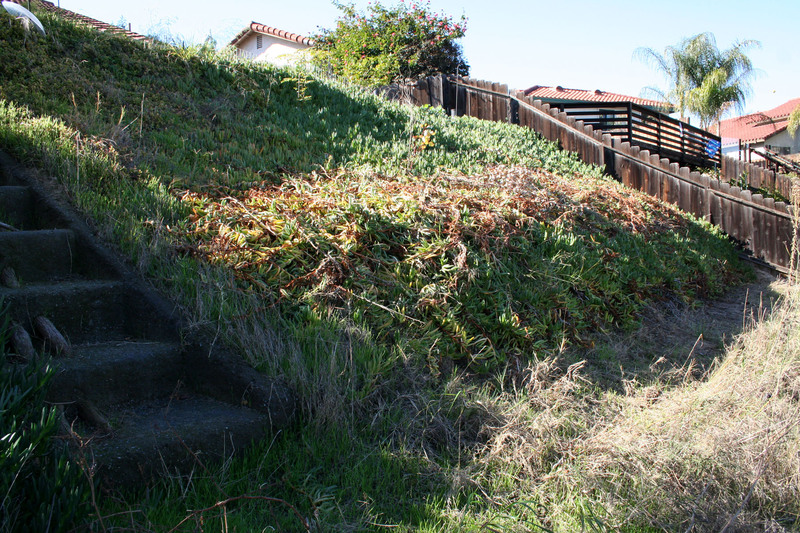 The previous owner had planted two bunches of invasive pampas grass in the bottom corners and a variety of ice plant (also very invasive) along the remaining slope. The pampas grass had grown into impenetrable tangles of vegetation nearly 20 feet across at the base that took many hours of labor back in 2002 to remove. Since then I built a rough-hewn set of free-form concrete stairs to the bottom level for access, but with the exception of removing the pampas grass clumps, we’d done nothing to improve the hillside. But the time has finally come to tame the hill. My container garden that takes up half the flat part of the backyard needs to expand into a permanent home, and I need room to stage materials for the fence rebuild project. So energized by my project plan, I inhaled deeply, took measurements, and ordered enough interlocking block to build the bottom wall for the first terrace bed. The block and half-yard of gravel was delivered Friday, amidst pouring rain and occasional hailstorms. 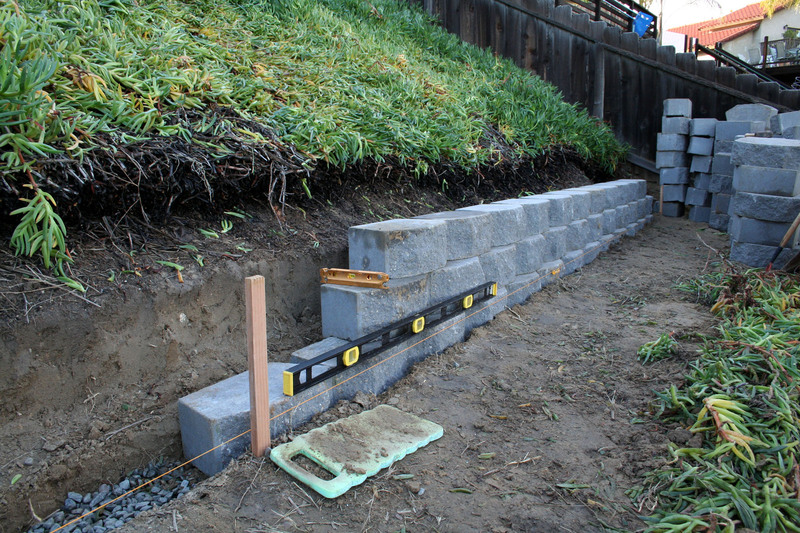 My goal is to complete the first retaining wall before we leave for our Kentucky farm trip on 6 Feb. The brown line of dead plants across is the ice plant I pulled out about a month ago, that had grown down from the bottom of the stairs to the fence (out of the picture at the right) at the bottom property boundary. In one year. Ice plant is a very vigorous, succulent invasive from South Africa, growing up to a meter in one season and rooting anywhere a stem touches the ground. Since it needed to dry out a little before running it through the shredder to make into compost, I threw it uphill as I pulled it. This current project started with pulling all that half-dried material down to the bottom, and moving it laboriously up the stairs to my utility yard one forkful at a time, where the huge mound of it awaits an afternoon’s work with Chewie, my stalwart Troy-bilt chipper-shredder. 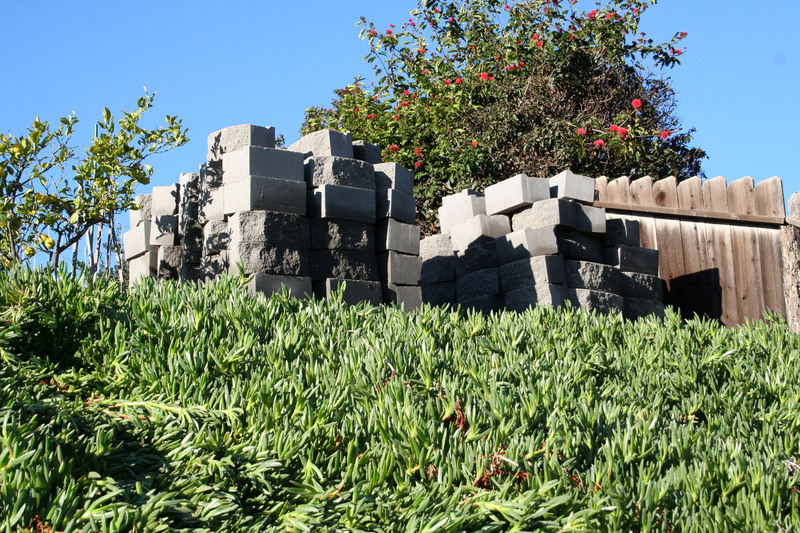 160 Keystone Legacy block will build a 35-foot long, 3-foot high wall. I spent the afternoon and part of Saturday morning imitating a small draft animal, first carting trugs of gravel down to the bottom and then 4 blocks at a time on my garden cart from the driveway to the edge of the hill in the backyard. 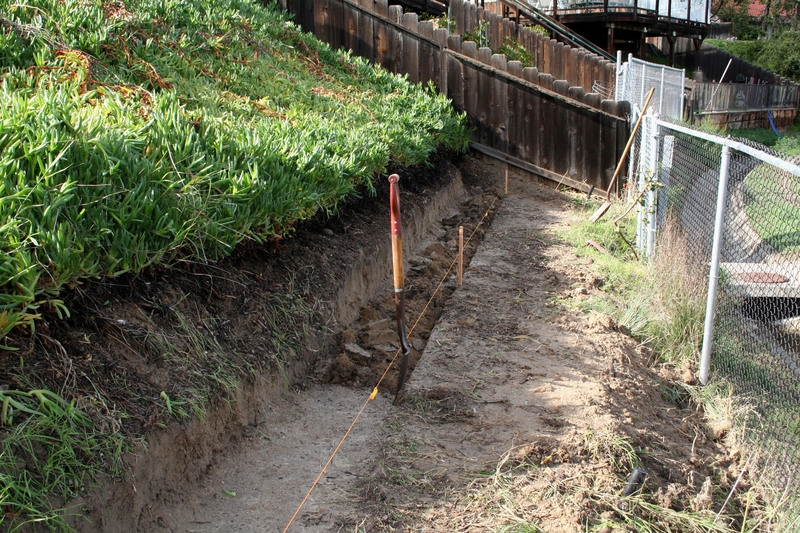 I’d already dug the footer trench for the wall (see first photo) and laid a couple of block when I realized I needed to somehow get all of them down to the bottom before I could really start serious wall building. So Sunday morning, that is what I did. My method was what I’d call “ghetto.” One woman, 160 blocks needing to be moved down 20 feet of ice plant on a 45 degree incline. Carrying them down the stairs one by one was out of the question. So I gerry-rigged an old half sheet of plywood backstop against the chainlink fence at the bottom, padded the whole affair with prunings of ice plant, and started rolling 55-lb blocks like bowling pins. It worked. No blocks were damaged in the making of this blog post. And at $3.50 apiece, that’s a good thing. Man, it was a lot of work, though. I managed to get three at a time rolled down without hitting each other, then had to clamber down the spongy bed of ice plant to stack them safely out of the way, and climb back up to the top for another round of ghetto block bowling. After a bit of rest, Sunday afternoon I started laying the first course. This is the most important element of the wall, these first blocks; they must be perfectly level or everything above will turn out badly. Following instructions, I laid a couple of inches of sharp gravel down, then set the block. Ever laid flagstone or brick? Levelling on a bed of sand is tricky at best; on gravel, near impossible. So, I cheated a little and used a bit of decomposed granite fill dirt overtop the gravel, to get the level right. It’s turning out well. I’ll backfill with gravel and lay weed-barrier cloth before pulling the dirt down as the courses go up. 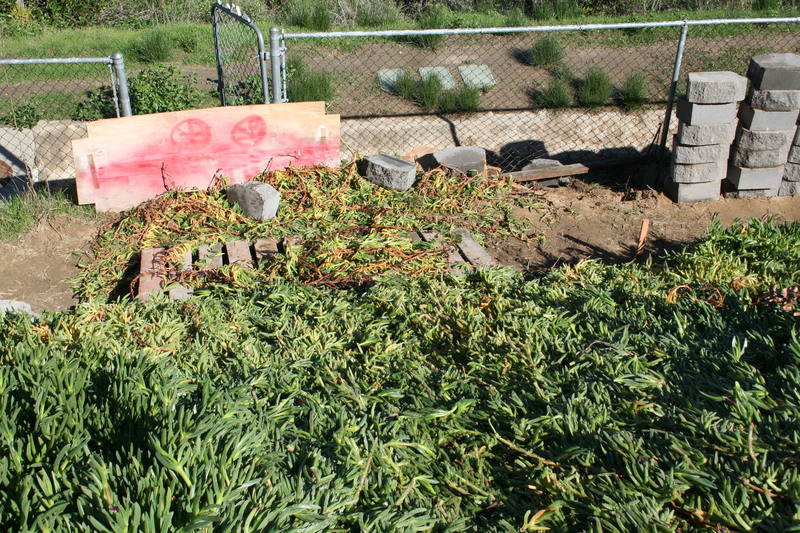 More ice plant removal will be required. Lots of compost to be made, hooray. Garden beds are dancing like sugar plums behind my eyelids. I can’t look at that hill without seeing all three terraced beds completed and a marvelous Spring garden emerging from the compost-enriched soil.